Despite the considerable improvement in durability and functionality of modern day dropper posts, one area that many brands still seem to get oh-so wrong is the lever. A well-built dropper post means nothing if it’s paired to a poorly designed lever that’s awkward and counter-intuitive to use on the trail. There are, of course, exceptions to the rule. My current favourites include the KS Southpaw, Specialized SRL, and Fox Transfer 1x levers, which all use a tidy design that places the lever parallel to the bar underneath the left-hand grip – exactly where a front shifter would normally reside, and without doubt the ideal position for a dropper remote. Wolf Tooth Components designed the ReMote as an aftermarket lever for use with cable-activated dropper posts. Sharing the same under-the-bar design, the ReMote from Wolf Tooth Components is another lever to add to that list. 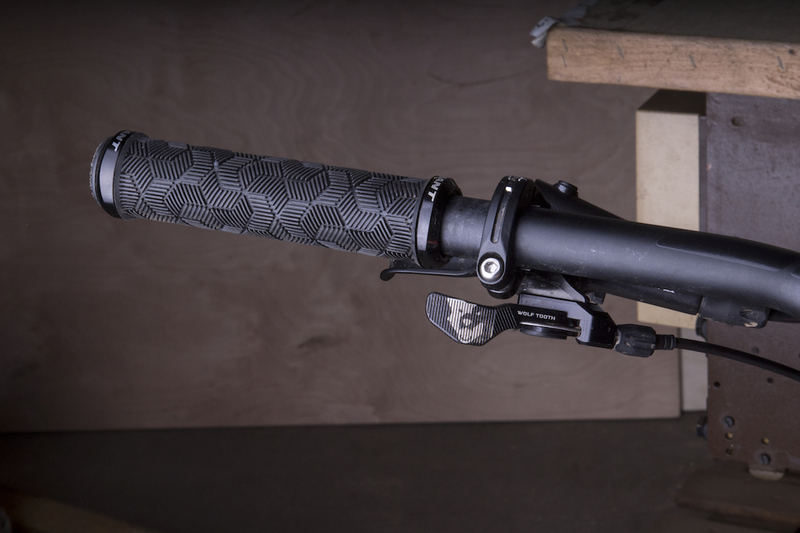 Machined in the US from 7000-series alloy, the ReMote is an aftermarket dropper post lever. It’s designed to replace your existing cable-actuated dropper post remote with a large paddle-style lever. Yes, the ReMote is for 1x users only – if you’re one of the three people left who still has a front shifter, the ReMote ain’t for you. Wolf Tooth offers the ReMote with a standard clamp, plus several integrated versions that offer compatibility with Shimano and SRAM brakes. The one I’ve been testing is the Shimano IS-II model, which features a curved mounting plate that wedges in between the bar and the clamp of later generation Shimano disc brake levers. 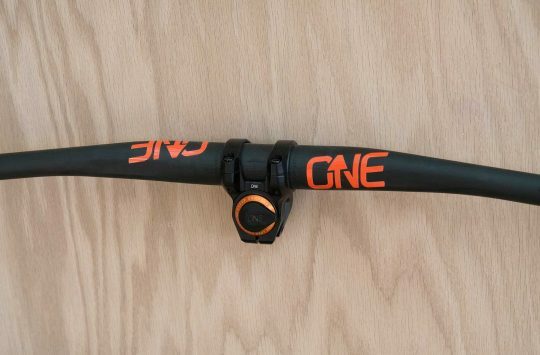 Our test ReMote was set up with a Giant Contact SL Switch dropper post and a Shimano M8000 Deore XT brake lever, though the design is compatible with most cable-actuated dropper posts on the market. That textured paddle is just so nice to use. Because the pinch bolt sits at the lever end, affixing the ReMote couldn’t be easier. Just undo the pinch bolt on your current lever, remove it, mount up the ReMote, then secure the cable back in place. 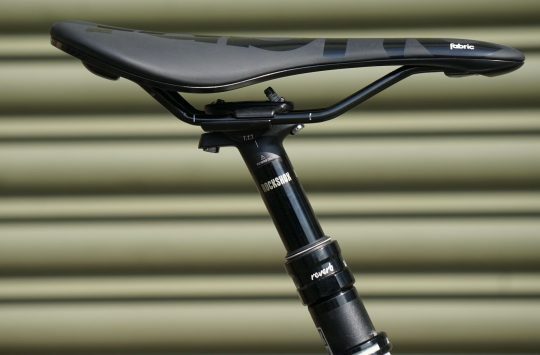 Simple, and no need to faff with insect-sized grub screws at the base of the seatpost. There’s angular adjustment thanks to the curved mounting plate, and the paddle also has 10mm of lateral adjustment to shift it in closer to the grip. When it comes to lever ergonomics, the ReMote is the best I’ve used so far. When it comes to lever ergonomics, the ReMote is the best I’ve used so far. The thumb-sized paddle has a lovely knurled pattern machined into the alloy surface that not only improves tactility between you and your machine, but also provides significantly more traction when the conditions are greasy. 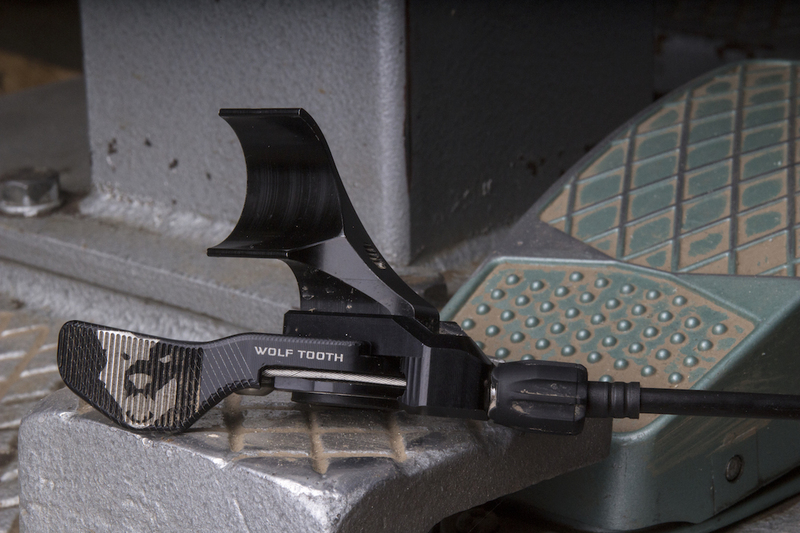 With the same action as a right-hand trigger shifter, activating the ReMote becomes instantly intuitive. The low-profile paddle sits close in to the bar, so your thumb doesn’t have to move far to reach it. Thanks to a decent amount of leverage and a large sealed cartridge bearing, the action is smooth and seamless, even with less than new cabling. A worthy upgrade for anyone with a cable-activated dropper post. 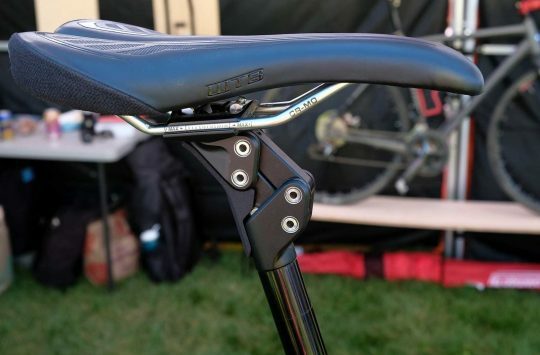 Compared to the stock Giant dropper lever, the ReMote is light years ahead in ergonomics. There’s less mental effort required to hit the lever in the heat of the moment, and as a result, I’ve been able to make use of the dropper a whole lot more. Wolf Tooth isn’t the first company to offer a decent dropper post lever, but thanks to its adjustability, low profile and tactile paddle, the ReMote is currently the best there is. Could you use this to activate the lock out on a Reba front fork? @jobro – No you couldn’t unfortunately. A lockout lever requires some kind of latch mechanism to lock it in place. A dropper lever could lock the fork out, but the lever would return it to the unlocked position as soon as you took your thumb off the paddle. A front shifter on the other hand can be modified to use as a lockout lever. 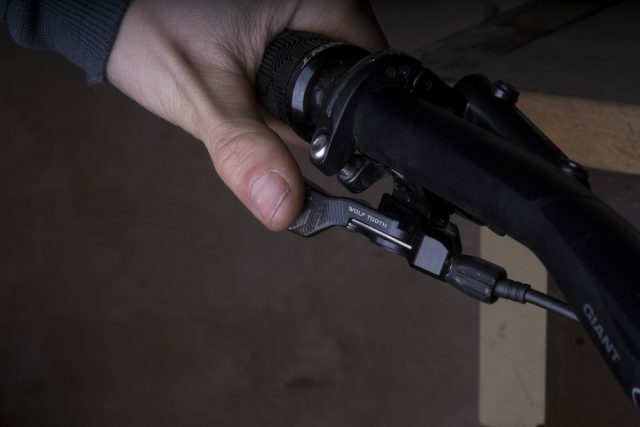 I’ve seen Shimano left hand shifters used to operate a Fox CTD fork, which looks super neat. Could be worth some experimentation with a Reba if you’ve got a spare front shifter lying around? Condescending much. A great many people still use a front shifter. One point to bear in mind re: the faff of installation. If your dropper post cable has an inline tension adjuster (like my Thomson Covert did), you’ll probably need to install a new cable when you set up the ReMote. Loads more faff (at least it was on my bike – took my inept hands a whole bloody afternoon). But I’m glad I did it – the ReMote is a brilliant lever. @rhayter – Glad to hear you like it! In general, I’d normally recommend running a fresh cable when setting up a new dropper post anyway. But yes, threading cables and using little pinch bolts can be fiddly sometimes. I agree. Probably at least a dozen. They also do a version for the stealth routed recent Reverbs that replaces the hydraulic release thingumajig. This is a really great piece of kit. I bought one after reading the 113 review and it saved my Thomson Covert from room 101 nomination. For the inline tensioner i simply had to shorten the outer on the lever side of the barrel adjuster and all worked perfectly. Highly recommended but the price is somewhat alarming. $60 though – so probably £60 by the time you get it to the UK. Someone saved my holiday from frustration after I broke my Fox Transfer lever with my thigh (an impressive bruise) by giving me a Bontrager lever. Surprisingly heavy but feels nicer than the stock Fox in use and they’re less than £20.